Dec 21 marks the date for the Winter Solstice Festival, also known as the Dongzhi festival. 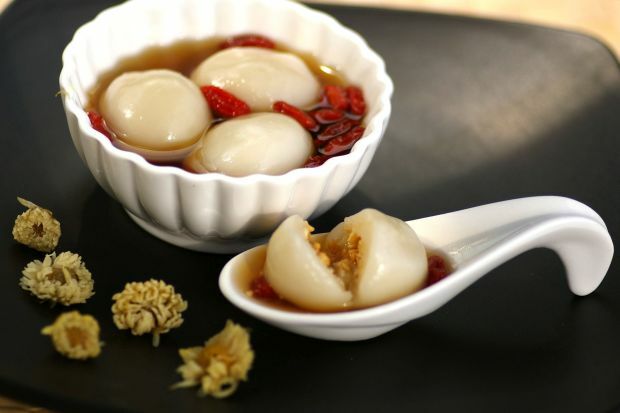 Tangyuans (glutinous rice balls) are traditionally made on this day to symbolize “togetherness”. It is served as a dessert that can be made with assorted flavours. So, here is the recipe for dumplings in fragrant syrup. Combine the flours in a mixing bowl. Gradually add enough water to knead into a soft and smooth dough. Set aside for 10 minutes. In a small bowl, combine all the ingredients and mix well. Chill for 30 minutes, or until firm. Shape into little balls using 1/2 teaspoonfuls of filling. Keep chilled. Divide dough into 25g portions using a scale. Flatten each portion and place a ball of filling in the centre. Wrap the dough around the filling and shape into a round dumpling. Bring half a pot of water to boil and cook dumplings until they float. Remove the dumplings with a slotted ladle and soak them in ice-cold water to stop the cooking. Bring water and dried chrysanthemum to boil and simmer for 3-4 minutes. Remove the flowers and add in goji berries, honey, sugar and salt. Serve the dumplings in individual bowls with the syrup.